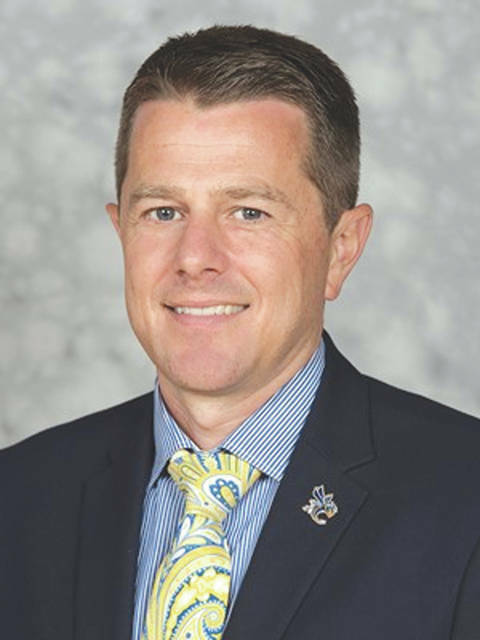 CEDARVILLE — Cedarville University Head Coach Pat Estepp has been selected the National Christian College Athletic Association (NCCAA) Division I Men’s Basketball Coach of the Year for the 2018-19 season, it was announced March 21. Estepp earned the recognition after leading the top-seeded Yellow Jackets to the NCCAA national title on March 16 in a come-from-behind 64-58 win over Roberts Wesleyan. It’s the second time for Estepp to pick up the award. He was the honoree in 2012 after guiding the Jackets to their first NCCAA championship. Cedarville won nine of its last 11 games to finish 21-12 overall for the program’s first winning season in six years. Estepp, 202-135 in 11 seasons at the helm, became just the second coach in the Yellow Jackets’ basketball history that spans more than a century to surpass 200 career victories. Cedarville finished fourth in the Great Midwest Athletic Conference at 14-6 and won its first round tournament game to advance to the semifinals. The Jackets went 13-4 down the stretch with three freshmen and a sophomore in the starting line-up. First-year players accounted for more than 40 points per game this winter. Estepp has a master’s degree in education from Cedarville University that he earned in 2008. Pat and his wife, Melanie, reside in Cedarville with their three children. Information provided by Cedarville University Athletics, yellowjackets.cedarville.edu/ , and the NCCAA, thenccaa.org/ .